WASHINGTON (July 18, 2013) -- Five service members, one from each branch of service, including the Coast Guard, were honored July 18, on Capitol Hill, as "Service Members of the Year," by newspaper publisher Military Times. The five were nominated for the recognition by fellow service members. They include Army Chief Warrant Officer 2 Karen D. Beattie; Marine Corps Staff Sgt. Clifford M. Wooldridge; Air Force Master Sgt. William G. Janczewski II; Navy Petty Officer 1st Class Joshua E. Beemer; and Coast Guard Petty Officer 1st Class Chase M. Severns. 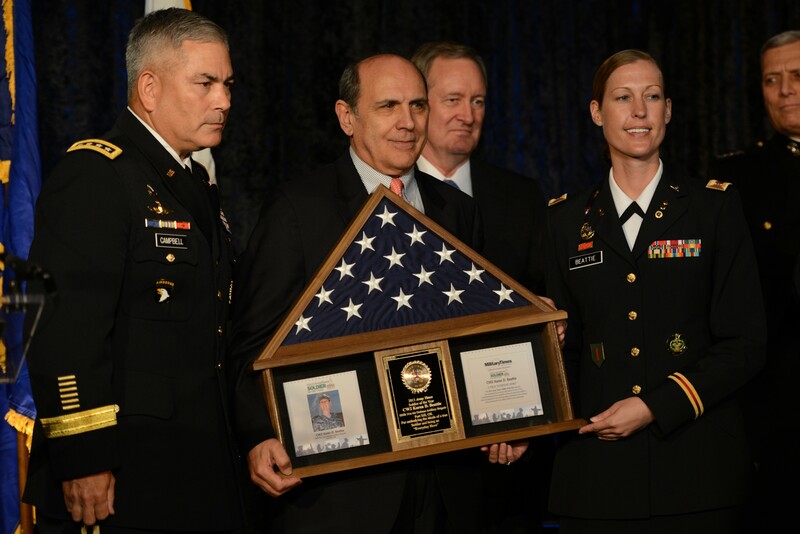 Vice Chief of Staff of the Army Gen. John F. Campbell and Richard Sandza, managing editor of the Army Times, presented the 2013 "Soldier of the Year" award to Chief Warrant Officer 2 Karen D. Beattie, during the 2013 Service Members of the Year awards in Washington, D.C. Serving as the keynote speaker for the event, Chief of Naval Operations Adm. Jonathan W. Greenert noted that the five were so impressive, their fellow service members had taken the time to sit down and nominate them for the award. The admiral himself was impressed. "They continue to put service before self while off duty as well as while on duty; volunteering to do such things as volunteer in the Make-A-Wish Foundation, teaching math and English to children in Afghanistan, raising awareness for Gold Star Families, building homes with Habitat for Humanity, and working with wounded warriors," Greenert said. Noting that July is the 40th anniversary of the all-volunteer military force in the United States, he said the award recipients represent the best of what America has to offer -- to those at home, and to those overseas. "These individuals represent a really special quality of all the service members that we have," the admiral said. "And they represent the face of the United States around the globe. They build the trust that enables the partnership that we need so very much to continue to do what we do around the world to ensure security. They are our ambassadors." Beattie, named the "Soldier of the Year," today serves as part of the 31st Air Defense Artillery Brigade at Fort Sill, Okla. She and her now-deceased husband, Sgt. 1st Class Clifford Beattie, had served together in Baghdad, Iraq, in 2011. He was killed in action there that May. The loss of her husband and friend left Beattie considering if she wanted to continue service in the Army. At the time, she'd already been in for 14 years. Acting as the military presenter for the award, Vice Chief of Staff of the Army Gen. John F. Campbell said that it was Beattie's faith that kept her in uniform. "She faced her struggle head-on and turned her grief into a way to support and inspire other Gold Star families -- families that have a fallen service member," Campbell said. Herself a Gold Star spouse, Beattie started an awareness program called the Fort Sill Survivor Outreach Services, or SOS, to provide support to other Gold Star families. "We just want to make the world better, and make people better, and make everything better for survivors," Beattie said of her efforts with the program. When she heard she'd been selected for the award, she said, she was surprised -- and humbled. "We just do what we do," she said. "There are so many amazing men and women in the military; and to get picked out of all of them is just humbling. It's just awesome." Beemer, a cryptologic technician and Arabic linguist with the Navy Information Operations Command at Fort Gordon, Ga., was named "Sailor of the Year." "Humbling. Humbling, to say the least," Beemer said of the award. "There are so many great things that every other service member is doing. We're finishing up two wars. We've been doing great things in the military for so many years. It's like -- why me?" Greenert, who served as the military presenter for Beemer's award, gave at least one answer for why Beemer had been selected. "While in Afghanistan, CTI1 Beemer dearly missed his wife and four-year-old daughter, Liliana," Greenert said. "He filled this void in his life by using his limited free time to serve as the secretary of the Cat in the Hat Language Arts Center. The center teaches Afghan children ages six to 11 basic English and math skills." Having served now about 12 years of active duty in the Navy, starting in 2000, and with a break in between -- Beemer said he plans to push on beyond 20, if he can. It's his fellow Sailors that make him want to stay. "You don't get rich in the Navy," he said. "But being able to work with young people, and people who have a sense of service, and of actually coming to work every day and doing the job -- it's not about coming and collecting a paycheck. I'm proud of what I do and I'm proud of what the junior guys do." "It's very, very humbling," said Janczewski of his being named the "Airman of the Year." "I see what happened as just doing my job. The volunteer work was just a way to pay back all my experiences, so other families or other people don't have to go through the same problems we went through. Being here tonight, it's just very humbling to be recognized for something on this scale." Janczewski's son, six-year-old Ethan, was born with Hypoplastic Left Heart Syndrome. The young boy was born with only a right ventricle and right atrium. The heart defect left the newborn in the hospital for nearly five months -- about four of those in an induced coma. Ethan is now in stable health. Vice Chief of Staff of the Air Force Gen. Larry O. Spencer, the military presenter for the award, said Janczewski and his wife were able to get through the difficult times thanks to support from friends and family. Now, Janczewski works to provide that kind of support to others who may face similar family crisis. He volunteers with the Arkansas Congestive Heart Defect Coalition to help others who are in the same situation now that his family was in years ago. An Air Force firefighter who is approaching 20 years of service, Janczewski now serves with the 19th Civil Engineer Squadron Fire Emergency Services at Little Rock Air Force Base, Ark. He said he plans to stay in uniform as long as he is allowed. "I love the job and I love the mission," he said. A boatswain's mate, Severns recently started a new assignment at the Aids to Navigation Team on the Columbia River in Kennewick, Wash., after having served aboard the U.S. Coast Guard Cutter Haddock, in San Diego, Calif.
Severns was described by Commandant of the Coast Guard Adm. Robert J. Papp Jr., who was the military presenter for the award, as "highly competitive." But at the same time, "willing to help those around him." Perhaps one reason Severns was named "Coast Guardsman of the Year" was his efforts aboard the Haddock to help his fellow service members prepare for advancement, Papp said. "Severns started a challenge to get the crew to study for their next Rating Advancement Test," Papp said. "He spent countless off-duty hours assisting crew members with their training and advancement sign-offs." Papp also noted that Severns' commander aboard the Haddock said he had been "instrumental in making the Haddock the most successful patrol boat in counternarcotics operations in the Coast Guard in 2012." Severns has been in the Coast Guard now for seven years, and plans to make it a career. He said he loves the responsibility laid at the feet of Coast Guardsmen, even when they are very young. "It's the responsibility that they give to a member," he said, of what keeps him in uniform and protecting America's waterways. "The Coast Guard provides that responsibility to very young people, very young in their military career, and allows them to develop into those great leaders." He said it was a "a great honor" to be selected for the award. Also honored to be recognized as "Marine of the Year," is Wooldridge, who serves now with Marine Corps Security Forces Training Company, Naval Support Activity Northwest Annex, Chesapeake, Va. While on mounted patrol in Afghanistan in 2011, Wooldridge and his team came under enemy fire. After gunfire subsided, and other Marines had begun to leave the area, Wooldridge was doing security around a building. Turning a corner, he found himself face-to-face with two additional insurgents -- which he dispatched. Shortly after, while reloading his weapon, he was surprised by the barrel of an enemy machine gun pointed at him from behind a wall. Assistant Commandant of the Marine Corps Gen. John M. Paxton Jr., who served as the military presenter for the award, said Wooldridge took the turn of events into his own hands as well. "Wooldridge dropped his empty weapon and seized the machine gun barrel and took on the enemy gunner in hand-to-hand combat," Paxton said. He was subsequently awarded a Navy Cross for his bravery, Paxton said. At home, Wooldridge works with disabled veterans as part of the Wounded Warrior Project, Paxton told the audience. "He has spent countless hours assisting disabled and recovering veterans," Paxton said. "Most recently, he was the host Marine for the Special Olympics of Virginia Beach and served as an athlete sponsor. He helped a terminally ill young man receive recognition as an honorary Marine." Military Times has presented the Service Member of the Year Awards for 13 years now. The company publishes such newspapers as Army Times, Air Force Times, Marine Corps Times and Navy Times.